As someone who works in online dating, I’m hyperaware of the multitude of options available for those of us looking for love for lust for sanity. I’ve tried my fair share, and while I could never use them all (Christian Mingle would kick me out in a heartbeat), I can certainly do my best to try as many of them as humanly possible for your entertainment. For the sake of brevity, I’m going to tackle websites and apps separately, even if most of the websites have accompanying native apps that appeal to the iOS snob in me. I’ve met (and dated) a few nice people from OKC, and I have good friends who are still dating people they met on PoF. I’ve also had some of my best bad date stories from each (while the rest, like my heart, belong to Tinder). Dude, y u no make sense? It takes a lot to gross me out. This succeeded. Also odd about Lava: My ‘free membership’ expired, which means I can no longer access the desktop version of the site. However, I have full functionality through the app. How do they make any money? I tend steer clear of eHarm for political reasons, and I’ve given Match a try without loving it enough to pay. Match.com, more like Meh.com, amirite? That being said, I am often told I should get myself to Match by very happy couples who met there. I suspect I might be a bit too … fringe for their user base. In the end though, if you’re on one site, you’re probably on a few. 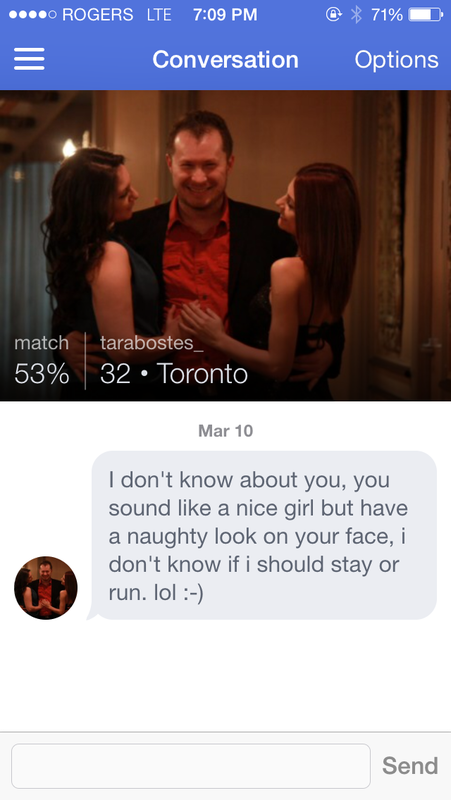 I’ve run into the same people on multiple sites (some of whom even had multiple profiles); I’ve had people who forgot they messaged me sent me a new message (including this lingerie-loving lad); I’ve even had someone message me on a different site who forgot we actually went out for drinks. Despite the millions of people residing in our fair city, the Toronto dating scene really is quite small. It never seems smaller, though, than when you match with your ex and you imagine them reading your shiny new dating profile. It’s enough to drive a gal to drink.